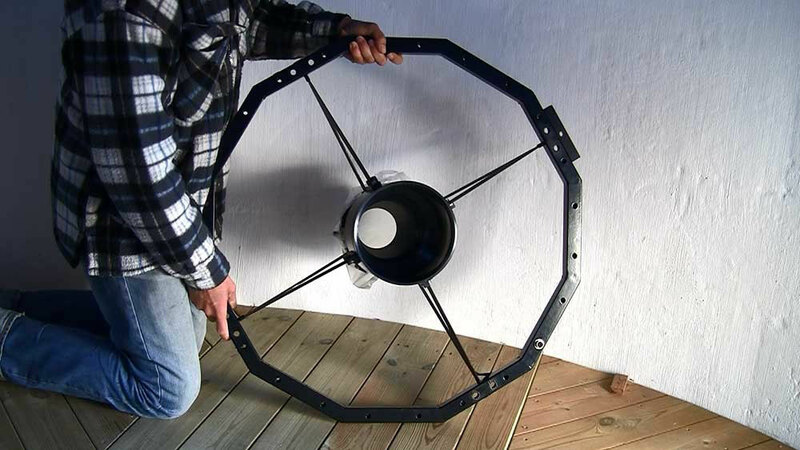 The spider assembly is shown prior to mounting on the optical tube assembly (OTA). When a camera, spectrograph or other detector is mounted at the prime focus, the secondary mirror is removed, as shown in the photograph. The photo shows the side of the spider that faces the primary mirror in the OTA. The flat field corrector is in the center of the spider. This corrector is similar to a Wynne corrector, and consists of three lens elements designed by Philipp Keller, an optical engineer at ASA Astrosysteme near Freistadt, Austria. The spider with the secondary mirror removed. The three-element flat field corrector is visible in the spider’s center gives an 80 millimeter flat focal plane. The entire assembly as pictured is 13 kilograms.